Fluids leaking from underneath your car could be symptoms of engine trouble. To identify the source of the leak you will need to carefully study the liquid color, frequency and the location of the drip. If your car was parked at a public place it can be difficult to distinguish whether the leaks came from your car or previously packed car. You can place a newspaper or foil near the source of the leak the next time you park the car. To fix the problem you will need to identify the type of liquid. Here are six common car liquid leaks to watch out for. An engine oil leak will be located underneath the engine. It often appears as a brown/golden color but can be darker depending on usage. Engine oil provides lubrication to the various moving engine parts like the crankshaft and the combustion chambers. The head gasket could also have developed cracks hence the leaks. Low engine oil levels will increase friction between the engine’s movable parts and eventually destroy your engine if not fixed. You can confirm the existence of engine oil leaks by checking the oil dipstick – if it is low do not attempt to drive the car until the leak is sealed. Engine oil is more viscous than the transmission fluid and you will not find it creating a puddle when it does know your engine is in serious trouble. The coolant is used to dissipate heat from the hot engine to the radiator. The radiator has a set of pipes that often develop cracks over time and leak the coolant. Coolant leaks are identified by the color of the coolant – which is normally green, yellow, orange or red. The color will depend on the brand but those are the most common colors. 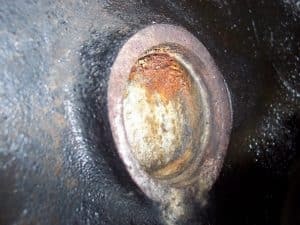 A coolant leak will often be located under the radiator or the pipes connecting the radiator. You can also observe the coolant low and high markings. If you had filled it to full and you notice the markings have dropped then it is a sure sign of coolant leaks. You cannot drive a car with faulty brakes. The brake fluid is identified as a brown fluid; it is more slippery than the engine or transmission fluid. 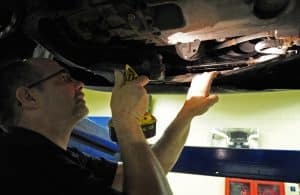 The brake fluid leak can be seen under the brake fluid reservoir, brake pedal and at times under the tires where the braking system connects with the wheels. Once the brake fluid gets depleted you will start experiencing problems with the caliper and the brake pads will not grasp tightly the rotors. Transmission liquid is red in color and is located under the transmission. If it has been long since you changed it you will notice that it has a brownish color and is thicker. It is also less viscous than the engine oil. In automatic cars, the first sign that your transmission fluid is leaking is when you notice the car revving without the gear being engaged. Manual cars may use the car’s manufacturers transmission and some models gear oil or motor oil will be used. To identify a transmission fluid leak, place a white paper/newspaper under the axle seals for front wheel drive cars and on the output shaft seals in the rear wheel drive cars. You should either notice a pink or red fluid underneath. New transmission fluid is less viscous and that is why it is reddish in color and accompanied with faint stain around it. The transmission fluid resembles the engine oil leak but the location of the leak will distinguish the two. Diagnosing the power steering fluid leak is a bit difficult because some cars use the transmission instead. If you are using the transmission fluid then be on the lookout for a distinctive reddish color. The power steering fluid ensures that you have control of steering with minimum effort. If you notice that with time it takes more effort to turn your steering wheel then check for leaks. Follow the hoses that connect the steering wheel to identify the leak. The power steering fluid has a smell of burnt oil and for most brands is amber in color. Check the reservoirs for signs of leakage. The reservoir has low and high markings. Most of the power steering fluid occurs at the steering rack. Check for the seals at both ends. Water has various uses in the car. It is usual to find some water droplets under the exhaust system when you power the car in the morning. The internal combustion engine produces water and carbon dioxide as byproducts. This water condenses in the exhaust system and is passed out when you warm the engine. however, if you notice water droplets under the hood of the car then there could be a leak in the cooling system or problems with the air conditioner. When it is extremely hot and humid the car cabin produces a lot of moisture. Through a hose located under the passenger seat, the humidity is drained from the car to the atmosphere. This is normal and should not be a cause of concern. For cars that use water in the radiator with some coolant, you will notice a reddish/green/pink colored water. You should follow the radiator hose connection for cracks. Check the seals that connect the hose. There are instances where your radiator could have leaks. You can check this by adding water into the radiator and watching its position after a few miles. Never open the radiator cap when the engine is still hot. Wait for it to cool down and use a damp cloth to open it. Having fluid leaks could be a signal for further engine trouble. It is dangerous to drive a car with low brake fluids or engine oil. The moment you notice that you are leaking fluids, stop driving and identify the source of the leak. You may need to call your mechanic for further inspection. Some leaks like air conditioner water leaks are normal.